Offering hockey leagues, figure skating, open skating, and professional skating equipment. The Wichita Ice Center is your ice sports destination. Whether you’re interested in learning to ice skate, adult or youth hockey leagues, figure skating, coaching, private lessons or speed skating, we have it all! If you're looking for something fun to do in the Wichita area, the Ice Center offers public skating and fun for the whole family! Our facility features Olympic and NHL rinks and full size viewing windows. We also offer banquet and meeting facilities, as well as the Party Zone for birthday parties. Party & celebration packages include skating, party room, party favors and more. Visit our pro shop where we carry a large selection of hockey and figure skating equipment from leading manufactures in the business. We also offer skate sharpening, blade mounting and other custom services to fit your skate needs. 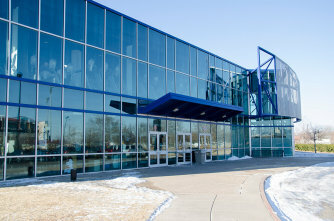 The Wichita Ice Center is home to Pucks Sports Bar and a Genesis Health Club. We're located across the street from Lawrence-Dumont Stadium. Open year-round.